If you arrive in Prague via train you will end up in the main train station – Hlavní nádraží. Your first reaction should be disappointment. It is a run down and seedy train station. It looks like it was built in the 1970's and left to deteriorate. There are scary looking people walking around. Old ladies with their whole lives in a bag, stand at the coffee machines and ask you for change which they know you have because you are buying coffee. Once you step outside there are homeless people standing about drinking beer and smoking. Do not get me wrong, it is a safe place, even at midnight, it is just that there are strange people around. They are strange, but not evil. It was not always like this. 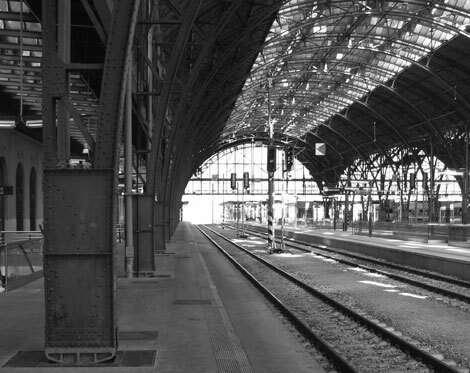 The main station used to be part of a beautiful Art Nouveau structure built in 1909. It was one of the main gems of Prague. Going to Hlavní nádraží used to be a pleasure and a romantic experience. But then in the 1970's thanks to the wisdom of the artistically blind communist regime the Art Nouveau structure was separated from the main station and connected to a horrible looking dark dispatch hall. The gem of Prague was left to rot. Now the main train station is purely functional - a place to go to get on and off the train, buy tickets and get information. But fortunately that is about to change. Currently there are major renovations being done to the main station and the Art Nouveau structure is being reinvigorated. In a year it will be back to its former glory. Hlavní nádraží is a five minute walk from Wenceslas Square – the hub street of Prague. It is also on the metro line C. Arriving at the station you are in the heart of Prague with easy access to anywhere. And just outside the station is a small park, in the summer a perfect place to lie down, place a piece of luggage behind your head, and sneak a quick snooze after a long train ride.